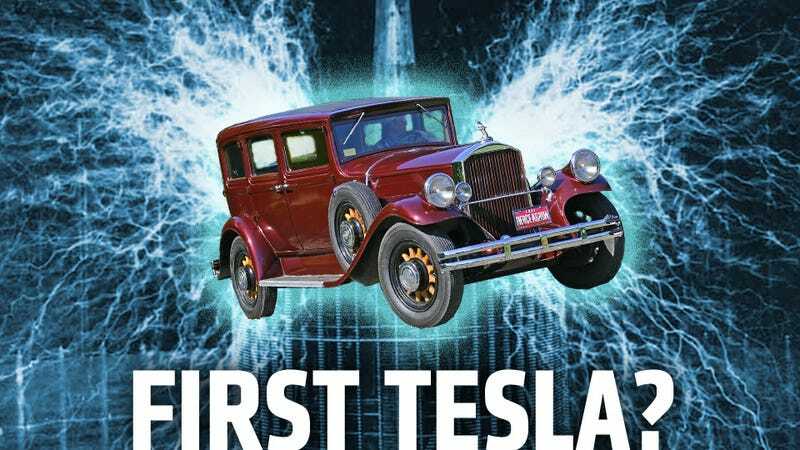 The modern Tesla is known for making modern electric cars, but the truth is the original Nikola Tesla made an electric car — and he did it all without batteries, way back in 1931. Since it was the man's 156th birthday earlier this month, and since that man essentially created the modern world as we know it, we kind of owe it to him to look at his car. The only problem is that most accounts of the car seem to come from the sort of websites that think perpetual motion machines are a great idea being kept down by a coterie of energy companies and space reptile Jews. Our investigation seems to suggest that the car credited to Tesla probably didn't actually exist. But the exciting thing is they likely could have, using technology Tesla was experimenting with. This same basic story comes up on many websites, some more reputable than others, but all have the same format. The person said to be taken for the ride is Peter Salvo, Tesla's nephew (there's no evidence he was), and the area is always around Buffalo, NY. The story seems to have been first published in 1934 (New York Daily News, April 2, 1934 titled "Tesla's Wireless Power Dream Nears Reality") and has been more widely circulating since about 1967 — here's an account from 1981. So where did this electric car story come from, and why is it so persistent? I suspect the story is so resilient for several reasons, first and foremost being that Tesla has an almost god-like status among many people, especially people inclined to be at best, more open minded and imaginative, and at worst absolutely batshit free-energy crazy. But there's also the tantalizing grain of possibility in all this as well. From 1901-1917 Tesla built and was experimenting with Wardenclyffe Tower, a facility used to (among other things) test the broadcast of electricity as EM waves through the air, much as we broadcast audio as EM waves through the air for radio. Such a system, if perfected, would in fact allow electric cars to operate without batteries. Ideally, it would allow anything to operate without batteries, as long as you were within range of receiving electrical broadcast power. If this had worked, and AT&T got involved, however, I'd probably end up pushing my wireless electric car all over my stupid neighborhood, though, based on they way they get a signal to my cell phone. So, if one reads the account in the context of a car driven by broadcast electricity, produced by more or less conventional means, and not a car driven by a Magic Black Box, then the story becomes much more interesting, because it is just possible that Tesla could have installed a receiver in an electric car (or car modified to be electric) that would have worked. There's no actual hard evidence he did this, but electric cars did exist and he had already demonstrated the ability to broadcast electricity, so the pieces were certainly there. I wonder if the "reasons with which the experts are familiar" are "tunnels." So, it looks like the popular story of the batteryless Teslamobile likely aren't true. But with batteries being the heaviest and most problematic component of electric cars today, Tesla's research and ideas may be deserving of a comeback. Wireless power transmission technology is making something of a comeback recently, and you'd think electric car manufacturers would love the idea. Aside from saving huge amounts of weight and solving the range issues, they'd be in a position to charge you a "power subscription" for your car. A wireless contract for your car— that's got to get them excited.